For the first time, our four girls find themselves in the same place. A few people from the pep squad have invited me to a party. Again. I'm really not the type to party a lot, even if most people think that partying like there's no tomorrow is an athlete's favorite pastime. Stop generalizing, people. But hey,just because I've never partied before doesn’t mean I can't start now—even if high school just ended. A number of varsities won a ton of games, and this is their reward. Maybe it can be mine, too. I cannot believe my sister. Our parents go on a mini-vacation, and she goes and throws a house party? No, wait, it's not just aparty; it's THE party of the year, according to all the tweets and Snapchat stories. This isn't the first time she's done this, but I thought she'd learned her lesson from last year's debacle involving drunk party boys and my mom's favorite vase. Plus, I can't believe she has the audacity to ask me to be the photographer. What does she need a photographer for? She can't even ask me how I'm doing, but she thinks she can go and boss me around like that? The nerve. I had plans with my couch tonight when all of a sudden I hear a thud—my phone was vibrating so much, it fell off my dressing table. Only Sam has the power to drag me out of my watering hole for a silly house party. I throw on the new dress I bought on impulse last week and figure it wouldn’t hurt to check out the crowd. It's 8PM, the party is starting soon, and I'm still standing in front of my closet with nothing to wear. Which is totally not okay if you're hosting the biggest party of the year. I hate this eternal dilemma. I'm pretty sure Rae has been stealing my tops. I reach into the back of the closet and pull out all my clothes until they're one big pile on the floor I can sift through. Looks like I'm gonna have to go with my trusty denim shorts. Ben always complimented them. He said I looked like the perfect girl next door. I can't believe it's been a week and he hasn't replied to a single text or call. I don't even know if I'm upset that we broke up or just upset that he got it all wrong. Who am I kidding? He was right about Mike and I was just in denial. It was a long time coming but I really thought we could have ended as friends. Obviously, that's not possible when you've loved someone for three years but then decide you don't love them anymore. Ugh. I need a distraction. Maybe I should go check on Rae. She's been locking herself up in her room since her breakup, but the last thing I want is an awkward sister sob-fest. I'll just introduce her to a cute guy later. Thank God for my teammates! I would be so alone right now if it weren't for them. Contrary to my steadfast belief on parties, they're actually pretty fun. I guess I understand why people like them so much. And it just hit me: I'm really going to miss my friends once we're all in college. The house is spilling over with people and there are still more guests arriving. I can't stop looking around, hoping that familiar smile shows up. I want to convince myself I'm looking for Ben, but I can't take my mind off Mike. Where are you, Mike? KC said you were coming. Is my makeup okay? Hair? I can't relax. I need a drink. 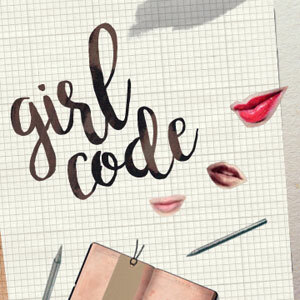 Girl Code: Should I Stay or Should I Go? Being the pushover that I am, I agreed to take photos of this "aaamaazing" party. Not quite sure what's so amazing about teenagers drinking way more alcohol than they can handle—my sister included, but whatever. Photography's something I love, and it's way better than sulking. In the middle of taking shots of some cheerleaders taking shots (haha), I hear a familiar voice. Oh boy. Pleasenopleasenopleasenopleaseno. "Hey, Rae... how are you?" Dammit. It's him. I turn around as slowly as I possibly can, and face James. He's wearing a clean white tee, holding two red cups. 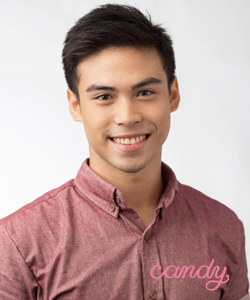 The face that I've been trying so hard to avoid is exactly how I remember it: too beautiful for words. I rack my brain for something to say, but I'm blanking. "Do you want a drink?" James says as he raises a cup to me. "You know I don't drink," I stutter. "I know... but a lot's changed since then. At least that's still the same," he says softly. His words feel like a punch to my gut, and I can feel the tears welling up. I walk away as fast as my legs can carry me, allowing myself to be swallowed by the swarm of sweaty partygoers, but not before I hear him call out, "Rae! Please, wait!" Rae just ran off and spilled my drink all over me. She's been on edge lately—at least that's what I hear from Sam when she mentions her sister in passing—and now my dress is ruined. I head for the stairs, figuring I can throw on something from Sam’s closet, when I feel a hand on my shoulder. "Hey, bar girl," Seb muses. "Excuse me?" I begin. "How are you even—?" "Friend of a friend of a friend... I forget," Seb replies, anticipating my surprise. "Texts go around, and parties like this sort of just blow up, you know? You smell like rum Coke. Want to get out of here?" Sebastian has the most beautiful eyes. I open my mouth to say yes when Sam grabs me hurriedly by the arm. The moment is gone before it even starts. Still no Mike. I guess he's not coming if he isn’t here by now. I pour myself another rum Coke. I've had way too many. My face is warm, really warm. And my body feels so heavy. I grab Lissa: "Let's dance!!!" Whoops, I said that way louder than I intended. She's busy with some guy she just met. A friend of a friend of a friend. Who are half these people in my house? Some of them look like high schoolers. Probably Rae's friends. Where is she anyway? Damn it, I should've asked her to take my photos before things got this messy. Forget it. Some Miley song starts blasting through the speakers and I see my former teammates tearing up the dance floor. God, I love them. I take one last sip of my rum Coke and head overto join them, arms up in the air, not a single care in the world. I go where the crowd takes me, then plop down on the sofa, exhausted and on the verge of tears. To make matters worse, my sister's yelling like a madwoman, telling everyone to dance. Deep breaths, Rae. Deep breaths. I hide my face in my hands and force myself to calm down, until I feel someone sit next to me. Oh. Charlie. This is pretty awkward. I’m sitting next to Rae right now. After knowing what happened between her and James, and after she saw me with James the other day, I can feel the tension buzzing between us. Oh wait, she just smiled at me—does this mean she doesn't hate me? People are starting to leave, my buzz is fading, and I've lost pretty much all hope that Mike is coming. Maybe I was an idiot for even thinking that something could've happened between us. We only had a few lunches with KC, after all. But I could have sworn there was flirting there. We had a connection. Or maybe I'm just fooling myself into believing that. I find Lissa in the kitchen attacking the last slice of pizza and ask her, "Why do I always fall for any guy who shows me even the slightest bit of attention?" She raises an eyebrow at me. "Were you not just in a three-year relationship?" I shrug, frustrated and suddenly sad. "Maybe this crush on Mike got in the way of me really trying to fix things with Ben. Maybe I gave up too easy." It was quite awkward at first when Rae started talking to me. I thought she was just being polite, since she's the sister of the hostess. But after talking to her for a good hour, I realized she's not as bad as I deemed her to be. She's not just James's ex, or someone that caused James so much pain. And she's hurting, too. I guess I'll never understand relationships until I find myself in one, but all I could do to hopefully make her feel better was to keep things light. And even when we began veering away from small talk, the conversation flowed easily—well, at least I think it did. I hope I cheered her up in some way. Rae is actually an amazing, interesting, and profound person. No wonder James fell for her. I go back to my room after the party has died down and fall face-first on the bed. I don't know what to feel, but I am certain that Charlie isn't the mean girl she’s branded as. In fact, she was really sweet about my sudden word vomit about James and our relationship—or current lack thereof. And, apparently, James and Charlie aren't a thing. They never were. Does this mean... No. I dismiss that thought before it's even fully formed in my head. Thoughts like that just lead to heartbreak. I reach for my phone to set an alarm and see a text from an unsaved number. Ha. Who am I kidding? I know that number by heart. "I tried to look for you, but I had to drive Trevor home. I don't know what it is about what I said tonight that made you mad, but I’m sorry. I hope you’re okay. Good night." Oh my god. This is not happening. I rush to delete the message and block his number before I start thinking crazy thoughts again, but my phone suddenly buzzes with another text. "By the way, you looked beautiful tonight. But then again, you always do. —J"
Are you ready to meet Lissa, Rae, Charlie, and Sam? Who do you think they are? 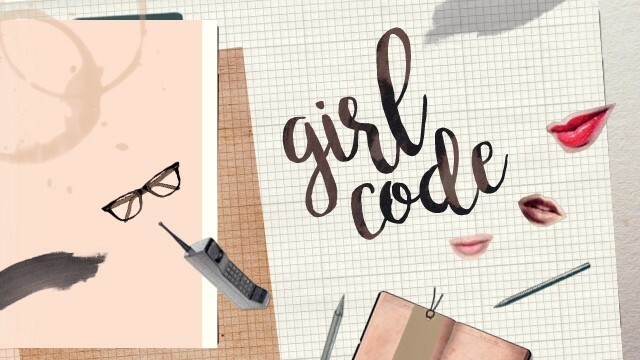 We're writing for the brand new YA fiction series, Girl Code.